Eucerin pH5 Shower Oil has been specially developed with extra mild surfactants suitable for cleansing dry sensitive skin. 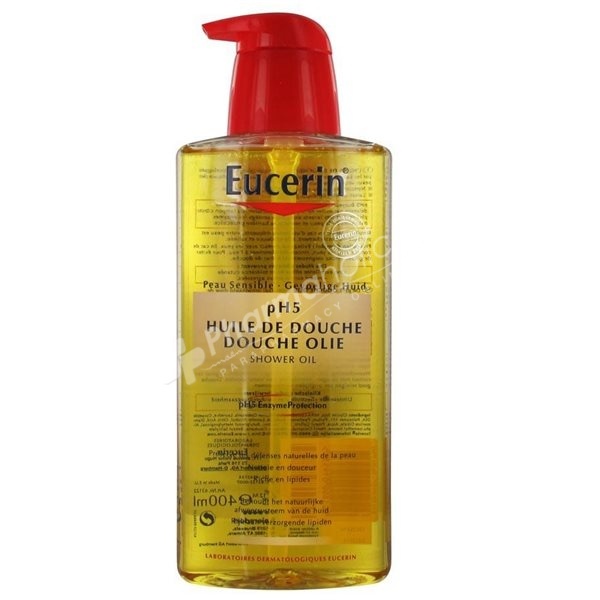 Eucerin pH5 Shower Oil has been specially developed with extra mild surfactants suitable for cleansing dry sensitive skin. The unique Eucerin pH Balance System gives the formula the optimal pH to protect skin’s natural defenses and preserve its resilience. Avoid contact with eyes. If product gets in your eyes, rinse off with water. To avoid slipping, rinse bath thoroughly after use. Glycine Soja, MIPA-Laureth Sulfate, Ricinus Communis, Laureth-4, Cocamide DEA, Poloxamer 101, Parfum (Fragrance), Panthenol, Bisabolol, Lanolin Alcohol, Citric Acid, Diammonium Citrate, Aqua, Propyl Gallate, BHT, Linalool, Butylphenyl Methylpropional, Alpha-Isomethyl Ionone, Hexyl Cinnamal, Limonene, Coumarin, Benzyl Salicylate.